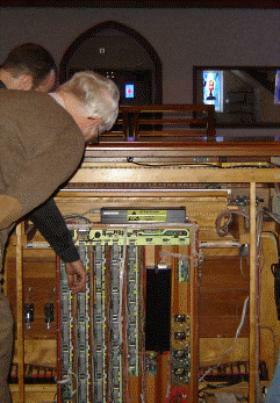 David Hufford shows off the painstakingly refurbished console to Ken Holden and Ed Price.. The group gathers around as Jim Wilkes takes a turn at the console. .
Jim wilkes watches as David Hufford shows the console electronics. 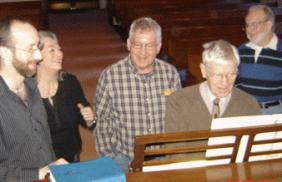 Ken Holden, MaryAnn Balduf and Ed Price marvel at the sound in the chancel. 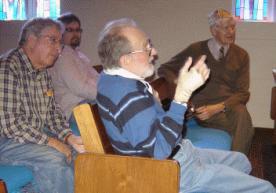 Clarifying a point are, from left, Ed Price, Kevin Wright, Ken Holden and Jim Wilkes. 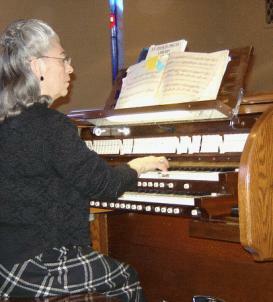 MaryAnn Balduf takes her turn at the console. 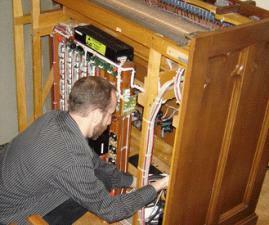 David Hufford stashes cabling prior to moving the console to its Sunday location. 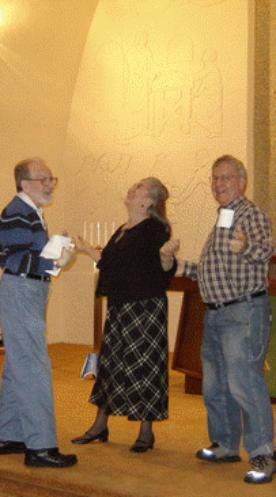 Chapter President Carl Balduf called the October 18, 2008 meeting of the Michigan Chapter of the Organ Historical Society to order at 9:50 a.m. at Angelica Lutheran Church in Allen Park, Michigan. Present were Chapter members Carl Balduf, MaryAnn Balduf, Ken Holden, Dana Hull, Ed Price and Jim Wilkes, plus guests Edna Higgison, Mildred Malcolm, Lorraine Rupp and Kevin Wright. 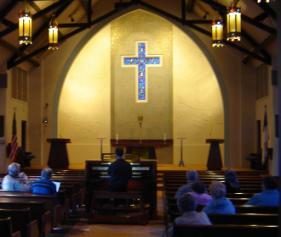 The meeting host was David Hufford, Angelica Lutheran Church Organist and co-owner of the Renaissance Pipe Organ Company of Ann Arbor. Ms. Rupp supervised a table chock full of goodies for the chapter members and guests. The meeting began with Balduf's request for approval of the minutes of the September 13, 2008 meeting as posted on the Web site and provided in printed form at the meeting. Approval was moved and seconded. The motion carried. Balduf then stated that the Treasurer's Report was not available. It has subsequently been received and is available below. Balduf also reminded the meeting that National Brochures were available for those wishing to join the National O.H.S. organization. Trinity Episcopal in Marshall is a III/37 of 1949/1961, by John Schleigh, done in Whitelegg style, with Schleigh's overlay of the American Classic vogue. Albion College is the IV/80 (1958), in the Ernest White style. The meeting would be followed by luncheon at Schuler’s restaurant in Marshall. The consensus of the group was that this is an excellent idea and directed that it be added to the venues for Spring of 2009. There being no further new business, the meeting was adjourned at 10:15 a.m. Following the meeting, members of the group adjourned to nearby Angelinas Mexican Restaurent for excellent authentic Mexican cuisine. David Hufford brings the group up to date about the restoration and enlargement of the Casavant Opus 2123. 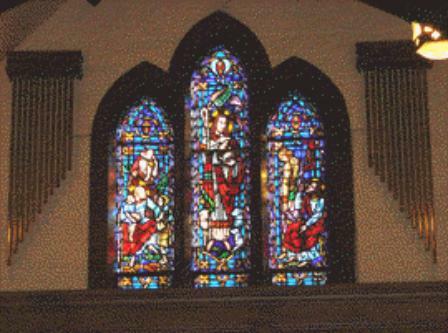 The chimes were separated and placed on either side of the rear stained glass window. 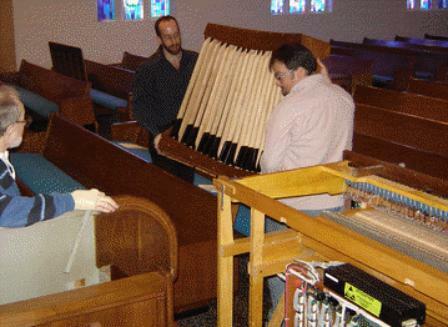 Ken Holden observes as David Hufford and Kevin Wright complete the relocation of the console to its Sunday service location. 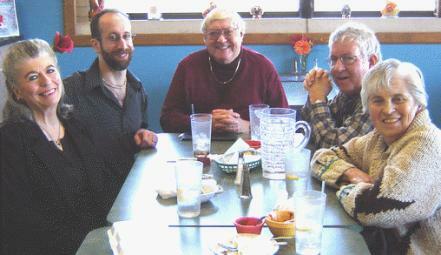 Lunch at the Angelinas Mexican restaurent, from left, MaryAnn Balduf, David Hufford, Carl Balduf, Ed Price and Dana Hull.